Chives are very easy to grow and, once established in your garden, you will find yourself searching for ways to keep up with the growth. 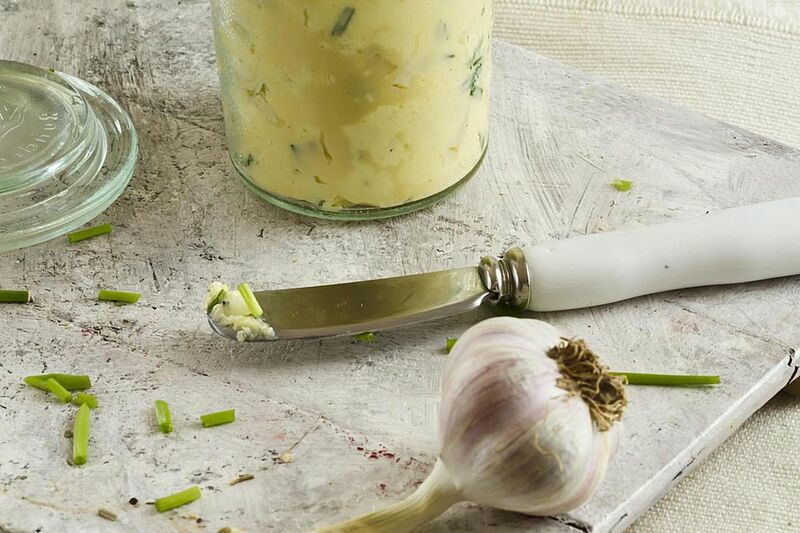 Garlic chive butter is just one of many chive butters you can make with freshly cut chives. The butter is great for making toasted garlic bread and can be used to fry hash browns as well as to top off a big mountain of mashed potatoes. If you have never grown chives in your garden before, head over to a garden supply store and buy a small chive plant. Grocery stores also sometimes carry the plants because they are a popular seasoning. Don't worry if your chive plant is small, It will grow fast. If you know someone who has chives growing in their garden, you can always ask for a bit of their plant. My chive plant would grow so large that each year I would take a shovel to it and hack it down into smaller plants to give to my neighbors. Judging by the size of it now, after I moved and only took a small portion of the larger plant, I will be back to dividing up my chives again this summer. You can grow your chives in the ground or you can grow them in a large planter. The plants look ornamental and, in the summer, they will grow large purple flowers that you can harvest and use to dress up your salad. Yes, the flowers are edible. Harvest the chives whenever you need them using kitchen scissors to clip the chives off of the main plant. I like to give the leaves a quick rinse under cold water, dab them dry with a paper towel, and then either cut them into small bits with a knife or the scissors. Cream the butter, garlic, and chives together in a bowl or container you will be storing the butter in. Cover the herb butter and store in the refrigerator for 3 hours before use. The butter will keep for several days, but it is doubtful it will last that long. If you are vegan or have allergies to dairy products, you can replace the dairy butter with a vegan butter. I prefer Smart Balance butter because it tastes very similar to dairy butter. The butter can be used for a wide variety of cooking. Spread it on a slice of bread and toast the bread in the over for quick garlic bread. Use it to fry pork chops or chicken. Put a glob of it on your baked potato or use it on vegetables. Homemade Butter in Less Than Ten Minutes!